SciencePoles meets with Dr. Tas van Ommen, a paleoclimatologist from the Australian Antarctic Division who has been focusing his attention on studying ice cores extracted from the Antarctic Ice Sheet in an effort to improve reconstructions of past climates and calibrate ice core data against modern meteorological data. In this interview, Dr. van Ommen discusses the ICECAP project, why the Aurora Basin region of East Antarctica can be vulnerable as the climate and the oceans warm, and the search for the oldest ice in Antarctica, among other topics. Could you describe the ICECAP project? One of the things I’ve also been involved with that’s a bit of a tangent to the ice coring is the ICECAP airborne radar survey work we’ve been doing over East Antarctica. It’s very interesting because there are large areas that have had little or no prior survey work and so we really had the sparsest estimate of what the bedrock under the ice sheet looked like. With the denser airborne radar soundings we’re doing, we’re building up a much more detailed picture of a region known as the Aurora Basin. This is a fairly deep bedrock basin. It extends quite far below sea level: 1.5 - 2 km or more in the deepest regions. This region is several hundred kilometres inland from Law Dome and Casey Station. Before we started taking the soundings, we knew there was a hole or a basin there from the sparse data that existed. But now that we’ve got the ICECAP data, we’re seeing the structure of the basin. We’re finding that there are much more extensive regions at depths of more than a kilometre, and we’re finding that some of these regions extend all the way to the coast. So we’re starting to build up a picture of something that’s more akin to West Antarctica, where the base of the ice sheet is below sea level. How is this region similar to West Antarctica? It had been thought that East Antarctica was pretty well perched up on mountains and therefore much less vulnerable to changes compared to West Antarctica. That might be true of a large part of East Antarctica. However we’re also finding that there’s a larger region than we thought in the Aurora Basin, and the bedrock there lies well below sea level and is probably fairly well connected to the ocean at the coast. This raises the probability that – as we’ve already seen in West Antarctica – if you’ve got a warming ocean in contact with the ice, it can start to draw down ice which flows more quickly, and this can cause the grounding line to retreat. But because the ice is grounded on rock that’s below sea level, as the grounding line retreats, the ocean follows the grounded ice further and further back into the interior of the continent. In fact, if you have bedrock that slopes to deeper depths as you go inland, which is also grounded below sea level, it’s possible for the ice margin position to become unstable and retreat abruptly. This is what’s called the so-called marine instability. So even though the surface of the ice might be several tens of degrees below zero on average, you can still end up with a situation in which a warming planet and a warming ocean in particular accelerate ice loss as the ice starts to flow more rapidly towards the coast. If you look at the paleoclimate record with the data scientists have been able to gather thus far, is there any evidence that this part of East Antarctica might have experienced rapid ice loss in the past, and then saw its ice cover come back? The records we’ve got right now don’t go far enough back. The oldest record for this region of East Antarctica is the Law Dome ice core, which only goes back 90,000 years. It tells essentially the same story that you see in the deep ice cores of Dome C or Vostok: that there’s been a regular, orbitally-paced change in temperatures and very little evidence that the ice sheet itself has undergone dramatic change over those timescales. However if we go back to the last interglacial – the time before the last ice age, about 120,00-130,00 years ago called the Eemian Period – there are suggestions that sea level was 4-6, perhaps even as much as 9 metres higher than present-day levels. Where this extra water came from raises the question “Was East Antarctica actually contributing to a higher sea level more than we think?” It’s an open question at this time. I don’t think anybody knows for sure. What is the current thinking on this? The thinking at the moment is that Greenland still had an ice sheet covering it during the Eemian, and possibly contributed only a couple of metres to sea levels at the time. As for West Antarctica, we don’t know whether there was much ice covering it in the Eemian. There’s probably about 4-5 metres sea level equivalent in the ice in West Antarctica. Sea levels would have risen 6 metres if all of West Antarctica had melted, but some residual ice would likely have remained in higher areas. So, in some of the possible scenarios you’re still left having to account for a considerable mass of ice from East Antarctica. It could well be that the East Antarctic Ice Sheet – especially around the Aurora Basin region, which is well below sea level and is in direct contact with the ocean – did change significantly during the Eemian. One of the things we know about the present day is that the region in which one of the major outlet glaciers in the Aurora Basin, the Totten Glacier, is currently located in one of the regions in East Antarctica that’s showing change. The top of the Totten Glacier has been dropping by 1-2 metres a year at the moment. This is not well understood but thought to be very likely associated with a warmer ocean, leading to thinning and drawdown of the ice. So it’s an increasingly interesting area of focus to try and understand what’s going on. One of the reasons why we’re doing the radar survey in the Aurora Basin is so that we can feed those boundary conditions and knowledge of the bedrock into better model projections of what’s going to happen in a warming climate. This is relevant for looking back at the Eemian Period because estimates are that the Eemian may have indeed been about 3°C warmer than present. These are possibly the kind of temperatures we might see in the future in a warming world, even though there are efforts to avoid temperature increases of that magnitude. It’s not impossible, especially if we don’t see appropriate action on global warming. But there are clues from East Antarctica as to where we’re going. Are you able to determine what atmospheric circulation might have been like during the Eemian? Not from my work. But certainly the Dome C, Dome F and the Vostok core cover this period. These cores have levels of dust and particulates that can tell us something about past circulation and this is still an area of active research. But one of the things that would be very useful to us – and something that the scientific community has been talking about for some time – would be to recover an ice core that would give us a more highly resolved Eemian record from Antarctica than what we’ve been able to see in the long ice cores that go back 600,000 or 800,000 years. Another reason why we’re doing the ICECAP radar survey is so that we can identify where might be good places to go for future ice coring. Not only do we want to get a better record of the Eemian, but there’s also international interest in drilling the oldest ice we can find – ice that would go back more than a million years. Over most of the last million years, ice ages have pulsed with a 100,000 year cycle; this is clearly seen in the long ice core records. Prior to a million years ago, ocean sediment cores show the ice age cycle was about 40,000 years, with the change occurring gradually at around a million years before present. So a core extending into this period of shorter ice age cycles – say to 1.3 or 1.5 million years ago – would allow us to probe the reason for this change. There are thoughts that changing atmospheric CO2 levels might have been responsible. So if we were able to get an ice core that covered the period when the cycle shifted and then look at the air trapped in the ice bubbles from ice that formed back then using analysis on existing ice cores, we could be able to answer that question. Are there any plans to take an ice core at Aurora Basin? There’s a plan to do so, but it hasn’t been realized yet. We had a plan to go to Aurora Basin during the austral 2008-09 summer season. Unfortunately, we were thwarted by bad weather, which left a surface that planes couldn’t land on. It was too rough with the sastrugi (surface undulations caused by wind) in the snow. Right now we’re trying to reschedule that and possibly look at logistics that involve over-snow traverse so that we get away from the fickleness of weather and aircraft. Since the Aurora Basin is more than 2 kilometres below sea level, do you think you might be able to find ice there that dates back more than a million years? Probably not. The research we’re doing on the Aura Basin is going to be able to tell us more about what’s going on with the ice upstream and where we might need to go. Current thinking is that we probably don’t want to go for the deepest ice if you want to get the oldest ice. As it happens, where the ice is very thick, the ice acts as a good insulator, giving the maximum possible insulation from the cold surface temperatures; however the geothermal heat coming from underneath is able to melt the ice form below. In fact, there are extensive regions in the Aurora Basin and up onto the highlands in which there appears to be liquid water, with subglacial Lake Vostok being a prime example of this. Ideally, you want to find a site where there’s no melting going on at the base of the ice sheet. There are areas further inland up the Antarctic Plateau beyond Vostok and towards Dome A, where annual snowfall is at its lowest, which probably offer the best chance of finding million-year old ice, because you’ve got annual snowfall layers that are very, very thin. You’ve got ice that’s probably colder and drier than you get in the deepest basins. Aurora Basin would be the kind of place you’d go ice coring if you wanted to get a very detailed record of the Eemian. Our plans in the Aurora Basin at the moment are a bit less ambitious than that. In the first instance, we’d like to do a single-season coring effort that would take us back probably a few thousand years and give us an idea of the ice flow regime, the temperature in the ice, and most importantly for our efforts, it would provide us with a site where we could link the very detailed records at Law Dome to the longer but less detailed records inland at Dome C. This would be an intermediate site that would be quite useful for calibrating the deepest ice cores against the more highly resolved ones like the ones at Law Dome. The Chinese are planning to drill a core at Dome A in the coming years. Is there any chance they might be able to find ice a million years old or more? It’s very difficult to tell. There was a recent paper in the journal Science by another airborne radar team from Lamont Doherty – Robin Bell and her team under the Antarctica's Gamburtsev Province Project (AGAP) project. What they found were evidence of really interesting accretion ice structures at the bottom of the ice sheet where ice that has melted manages to freeze onto the base of the ice sheet. These structures are completely new to us and not well understood yet. There are still a lot of things happening – especially in the mountainous regions – which might make it difficult to find really old ice in the rugged terrain. It would be more ideal to go somewhere where the ice is flowing a little bit more uniformly away from the mountains. On the other hand, given what we don’t yet understand, I wouldn’t say it’s impossible that the drilling at Dome A will come up with some rather old ice. Whether or not they get the oldest ice is an open question. If not at Dome A, then where would be the best place to look for the oldest ice? There’s a ridge that runs from Dome C along East Antarctica past Vostok Station and up to Dome A. On the South Pole side of that ridge, the terrain might not be too irregular, and there is a low snow surface accumulation rate and no melting at the base of the ice sheet seems to be occurring. More work will need to be done with the radar and ice sheet modeling in particular now that we’ve got better radar data that can help us predict where to go to find the oldest ice. But we’re not there yet. A big international item on the horizon in the next five to ten years is to determine what’s feasible and where to go. In the meantime, the efforts the Chinese are putting in at Dome A are going to tell us some interesting things, regardless of whether they find the oldest ice or not. Will they start drilling at Dome A in the near future? They’re getting close. They’ve got a lot of the infrastructure set up at Dome A now, and I think they’re looking towards getting their drill technology towards where they need it to be. I would expect that in the next couple of years, they’ll probably be making a serious start. How does the AGAP project relate to the ICECAP project? The international ice sheet community is well networked. One of the goals of all of the radar projects is to create overall syntheses of the bedrock configuration of Antarctica as a whole. There’s a community project called BEDMAP, which has put together a map of the state of the bedrock some years ago. Projects such as ICECAP and AGAP are feeding into what will be a renewed and much more accurate BEDMAP2 project. There are a variety of techniques that will be used. How you deal with the inevitable large gaps between flight lines will still be an issue. It doesn’t matter how much money or time you’ve got; you never can take images quite s densely as you’d like. There are some clever ways of using ice sheet modelling techniques to use surface slopes in conjunction with the measurements you’ve been able to collect to do intelligent interpolation of bedrock data. In fact our ice sheet modeling team in Hobart uses just this sort of technique for understanding the ice flow. Tas van Ommen is a paleoclimatologist from the Australian Antarctic Division invovled in the international ICECAP project. His resarch interests lie in ice core palaeoclimate studies, with a focus on high resolution palaeoclimate work extending back into the last glacial period. 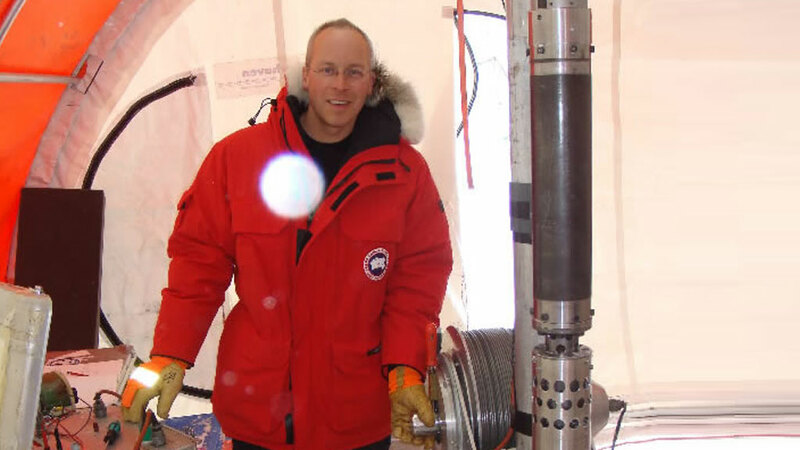 He uses date from ice cores extracted from the Antarctic Ice Sheet to improve reconstructions of past climates and calibrate ice core data against modern meteorological data.